Hey gang! How are you going? I have been feeling pretty good. Yep, I have. I’m enjoying the post-school life. There seems to be a lot more free time. Not quite sure why. Maybe it’s because I’m not having to run around sourcing costumes and dress up day clothes, which seemed to be needed with annoying frequency! So it’s good. But me being me, the guilt thoughts are starting to creep in, and there’s that little voice saying ‘everyone else is working, you need to be doing something!’ Because for some reason I don’t count cleaning the house, doing the washing, the garden, the cooking as doing anything! So I’ve started clearing out the attic to assuage the guilt. So much stuff up there! I’ve been making lots of trips to the Salvos! 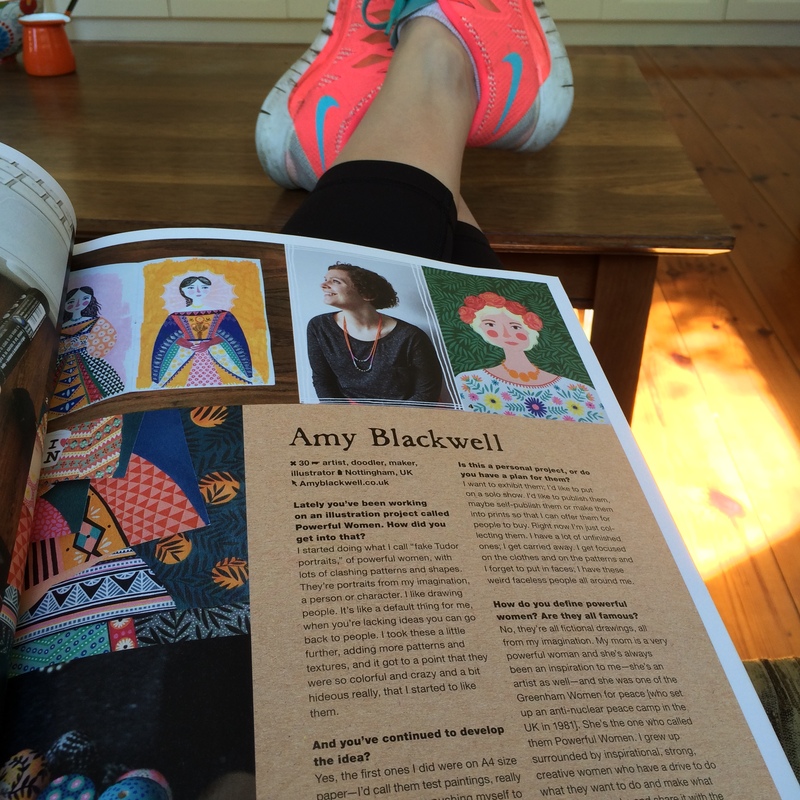 So apart from becoming a manic attic cleaner, what’s been happening with my freed up time? Making: still working away on my cosy stripe blanket. Had to undo about eight bands of colour the other night because I’d miscounted. Grrrr! Watching: This Is Us. I LOVE this! The relationship between Jack and child Kate, Randall (loved the night in the hotel excitement! ), William, Kevin. All so good! Wishing: the painter hadn’t found so much dry rot when he’d washed down the house! Eek! But what can you do? We have lovely new fretwork and window architraves now! Has March been good for you? Do tell! Howdy! How are we all? I feel like I’ve been away from the blog world for a little bit. I’m not quite sure why. My girl is back at school, my boy has been away on holidays so I must have had HEAPS of time by my lonesome to compose a post. I guess I’ve just been puddling around catching up on some of the people and places I haven’t caught up with for a few months or checking out new things to do. So here, for the record, are some of the things which have kept me from tapping away at the keyboard. Spotlight: I went to see this with my movie buddy and it was excellent. Have you heard of it? It’s about the investigative journalism team at The Boston Globe who uncovered the extent of sexual abuse by priests in the Catholic Church in Boston. Not exactly cheery but the focus was not so much on covering the abuse but rather how the team went about its investigation. Compelling performances by a great ensemble cast, including Mark Ruffalo and Stanley Tucci. Such genuine actors. Love them! Andy Warhol and Ai Wei Wei: Emily made the train trip from Ballarat to ‘the big smoke’ and we went to see this excellent exhibition at the NGV. It was HUGE and I think we were a little overcome by it all! We were both marvelling at the sheer volume of work that Ai Wei Wei has produced. TV: we’ve been watching the third season of The Bridge which has been excellent, as always. A bit retro watching just one episode weekly because we are so used to binge watching whole seasons at a time! We’ve also been catching up on season two of The Americans. Yep, we are a bit behind! Kept forgetting it was on pay TV after it disappeared from free-to-air. Crocheting: I made another one of these giraffes for the daughter of a friend of my mum who is awaiting a tiny arrival and I’ve started on these maybelle squares (well, I’ll turn them into squares!) in the ongoing endeavour to work through my wool stash! I’m going to join them up to make a blanket, I think. Can you guess what inspired my colour choice?! Friends: coffees with lovely friends. It’s really important to nurture our relationships, isn’t it? I try to make sure I don’t leave it too long between friend catch ups because in all the busy-ness of people’s lives (yep, I hate saying that – let’s remember we don’t have to fill every second of every day for our lives to be valid), relationships can easily slide. And that’s a great pity. Stuff: you know, the ordinary things. Domestic goddess duties, new school year adjustments, the admin of life. Not very exciting, but we all have to do it, don’t we? How about you? Have you been out and about doing nice things? Or have you been enjoying some quiet, reflective time? Hello there! I’m joining along with the delightful Catherine of Saint Cardigan and sharing my current crafty project. If you love weaving, nail art and reading about creative people, you should definitely head on over and have a squiz at her lovely blog. I’ve been hooking away at these beanies over the summer period. 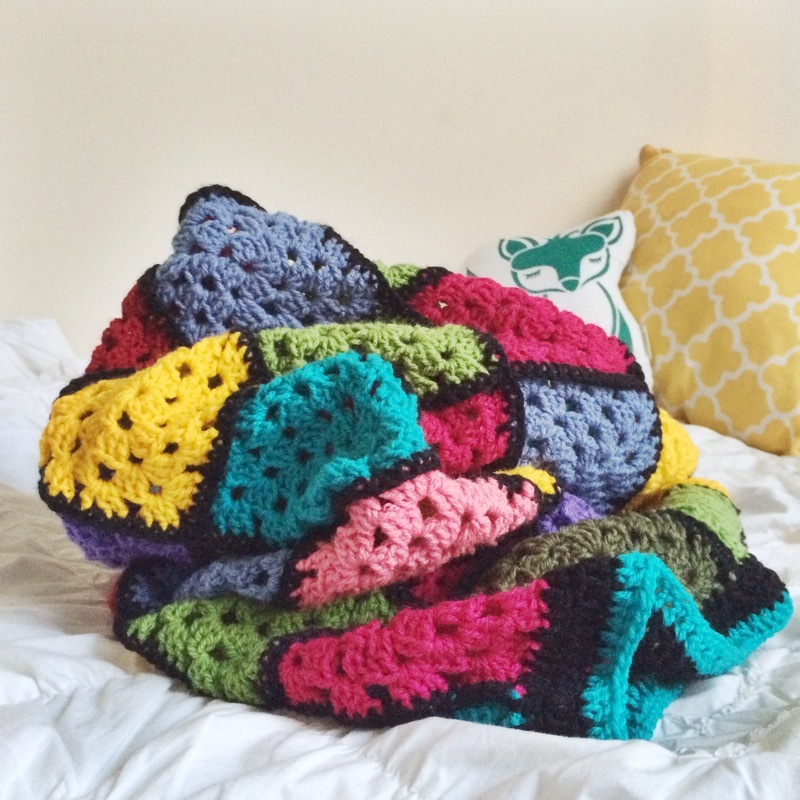 Most things I make are inspired by work I’ve seen by other bloggers. I first spied these woolly hats on The Messy Brunette and you can find the pattern here. I just have the crab stitch border to go on the black one. I’m tossing up between using the green or the turquoise. I’m thinking the turquoise. Thoughts? I really like making these beanies. They are very quick and easy to make so are the perfect creative project to accompany TV viewing. This is when the vast majority of my creating takes place, after the daily chores and commitments have been completed. They don’t require large quantities of wool so are EXCELLENT for using up all the odd bits that accumulate in my wool basket. I love scrabbling through my leftovers and working out which colour combinations work well together and how to create an eye catching arrangement. I am making these to donate to kogo so I like to choose something that is a bit cheerful and quirky in the hope that whenever the recipient pops it on, it will brighten their day. Do you have a project on the go? Would you like to share it too? If you pop over to Saint Cardigan, you can see what others have been up to. Hi dee ho ho ho! Is it starting to look like Christmas at your place? Here’s what’s been happening on the festive front for me this week. I decided it was time to get my Christmas bake on. I’m not a huge Christmas baker. My mum makes us a beautiful Christmas cake each year which we devour very quickly, but I do like to make something which sings of Chrissie. I made these bickies, not to hang on the tree, but just to pop in the biscuit tin. They are quite nice. Gingery and buttery. I drizzled them with some melted chocolate and I think that worked a treat. My buddy Deanna was having a stall at the Queen Vic Market so thought I’d hop on the train and have a little look see at what was on offer. Lots of lovely goodies! Bought some earrings and a bookmark from Deanna and a lovely little pendant from Atelier Nomada which I’ll get someone in the family to give me for Christmas. 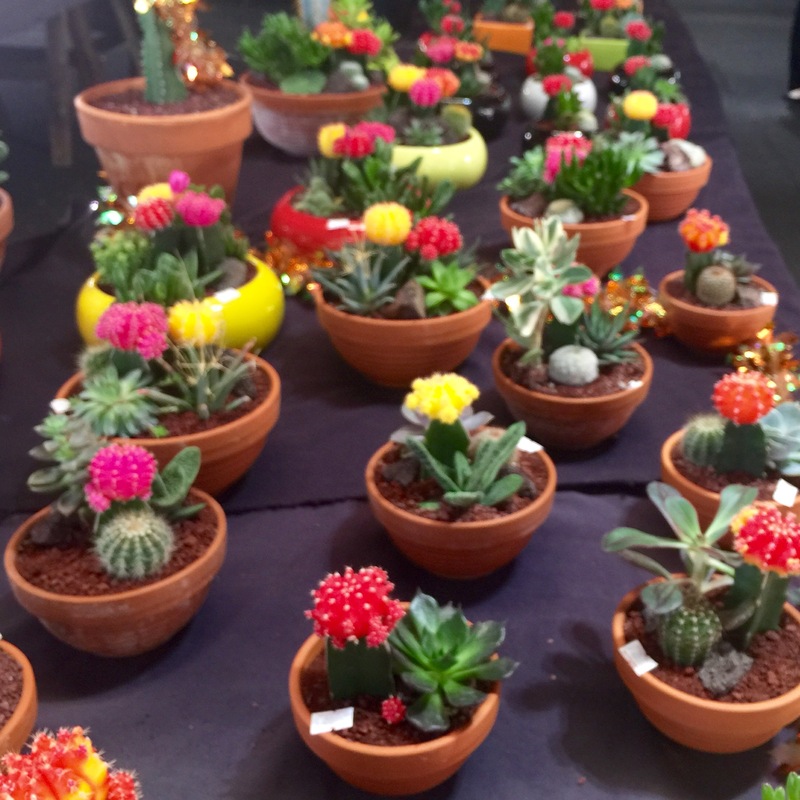 These succulents weren’t part of the craft market, just the ordinary market, but aren’t they gorgeous? I love their vibrant colours. A joy to behold. And Christmas is about joy, isn’t it? I don’t know who the crafty types were who did this, but I was pretty taken by these woolly trees. 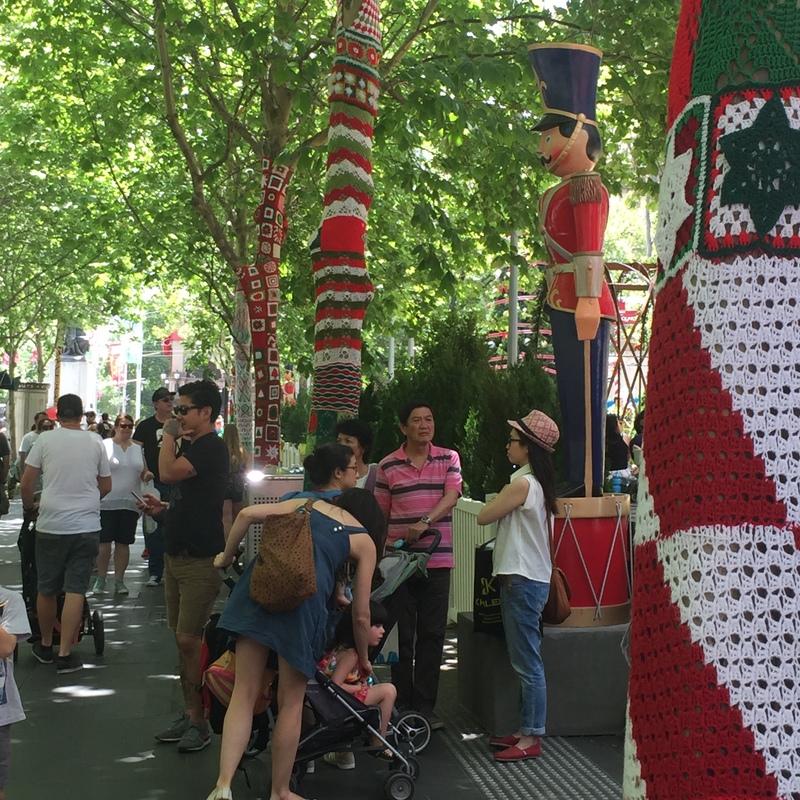 I think this adds a bit of handmade Christmas spirit to the city. Nice! 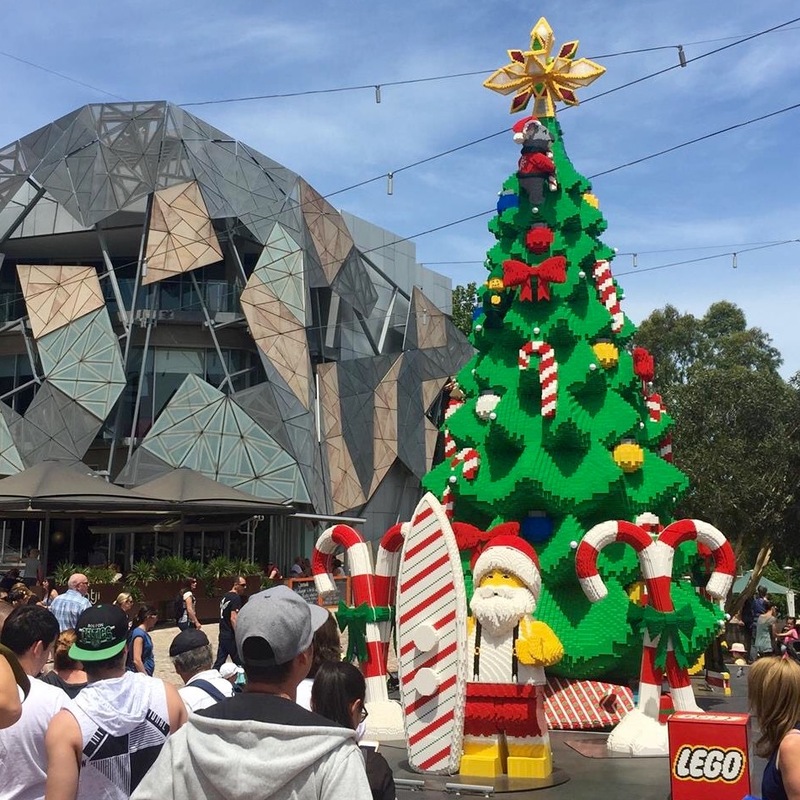 How many blocks were used for the Lego Christmas Tree? I hope they were a bit more ordered than one huge box with people rummaging around asking ‘Have you seen a green 8. No, not a long one, a four by two.’ Aah, so many Lego memories from childhood! Imagine the instruction sheet! I thought it was pretty cool. We’re going to do the Chrissie thing tonight – tree, wreath, Christmas lilies in the vase – all to the strains of my girl’s current Christmas favourite, The Andy Williams Christmas Album! Yep, my 16 year old is listening to Andy Williams -‘such a lovely voice!’ Do you have a favourite Christmas album? This is the final instalment of One + Four posts for the time being. Thanks for reading along with mine and for letting me read along with yours. 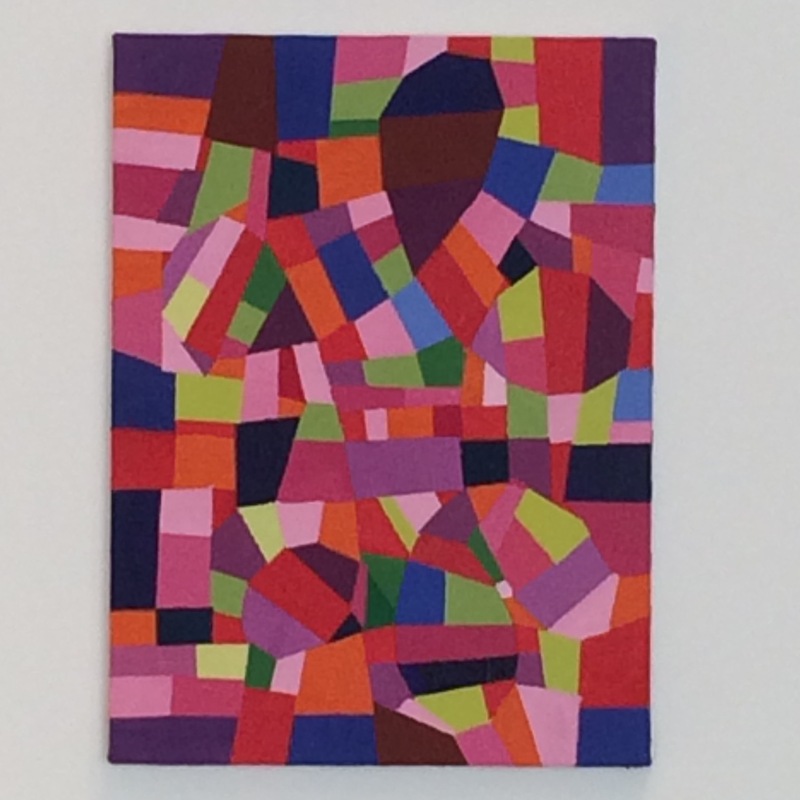 If you want to see what other people have been up to, pop over to Isabel’s blog. Thanks for being our host! 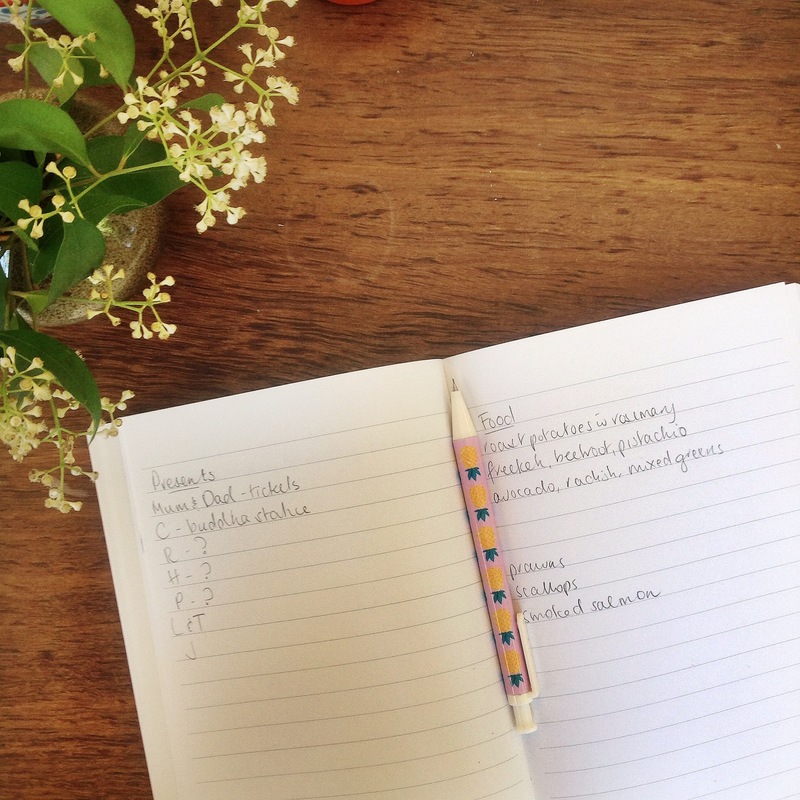 Are you making lots of lists at the moment? I’m compiling a few. There’s the present list, of course, but there’s also the Christmas card list, the food list, the drinks list, the crockery and cutlery list, the Christmas Day running sheet. They’re very functional lists, aren’t they? I want to make a fun list! So in that spirit, here’s a little list of things I’d like to do over the Christmas/holiday season. Hmm, I wonder how many of these I’ll actually get to do? I know I’ll also want to have some lazy days at home chilling in the back garden and watching the tennis on the telly. It would be nice to have weekend away with my man too. Aah, the joy of having kids who no longer need babysitters and who can drive themselves wherever they need to be! Have you thought about LAC (life after Christmas) yet? What is on your list of enjoyable things to do?